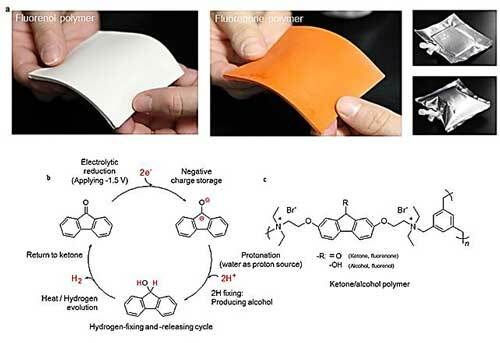 (Nanowerk News) A Waseda University (Tokyo) research group has developed a polymer which can store hydrogen in a light, compact and flexible sheet, and is safe to touch even when filled with hydrogen gas (Nature Communications, "A ketone/alcohol polymer for cycle of electrolytic hydrogen-fixing with water and releasing under mild conditions"). Although research and development on technology allowing hydrogen to become a major energy source have been going on for many years, the conventional methods of storing and carrying hydrogen were accompanied by safety risks such as explosions. Recently, hydrogen-absorbing organic compounds have been studied as storage materials, for their ability to stably store and release hydrogen through chemical bonding. However, these compounds require vessels or tanks maintained at high pressure and/or temperature and often encounter difficulty in releasing the hydrogen gas. Widespread commercialization of hydrogen as an energy source requires a safer and more efficient system for storing and carrying it. The research group, led by Professors Hiroyuki Nishide and Kenichi Oyaizu of the Department of Applied Chemistry, developed a ketone (fluorenone) polymer, which can be produced as a thin sheet, and can fix hydrogen via simple electrolytic hydrogenation in water at room temperature. Furthermore, the fluorenol polymer can release hydrogen when heated to 80 degrees Celsius with an aqueous iridium catalyst. The group proved that under mild conditions the cycle of fixing and releasing hydrogen can be repeated without significant deterioration. The advantages of the ketone/alcohol polymer include easy handling, moldability, robustness, non-flammability and low toxicity, pointing the way to the development of a light, thin plastic container that can be carried in your pocket. The new material is also expected to contribute to the creation of distributed energy systems, especially in remote areas.